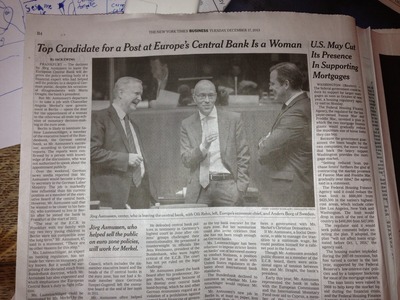 "Top Candidate for a Post at Europe's Central Bank Is a Woman" is the headline the Times business section runs over an article by Jack Ewing, the male Times reporter last seen airbrushing the Faber-Castell company's World War II history. Leaving aside the totally pertinent question of whether Sabine Lautenschlager's gender is the most newsorthy thing about her, one has to wonder about the decision to illustrate an article with that headline with a photograph of three men. The Times Web site does have a photo of her, if you are curious.